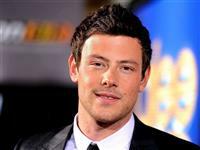 This memorial website was created in memory of our loved one, Cory Allan Michael Monteith, 31, born on May 11, 1982 and passed away on July 13, 2013. Where Cory Allan Michael Monteith is buried? Locate the grave of Cory Allan Michael Monteith. How Cory Allan Michael Monteith died? How to find family and friends of Cory Allan Michael Monteith? What can I do for Cory Allan Michael Monteith? Cory Allan Michael Monteith was a Canadian actor and musician, best known for his role as Finn Hudson on the Fox television series Glee. Born in Calgary, Alberta, Canada, and raised in Victoria, British Columbia, Canada, Monteith had a troubled adolescence involving substance abuse from age 12, and he left school at 16. After an intervention by family and friends, he entered drug rehabilitation at age 19. As an actor based in British Columbia, he had minor roles on television series before an audition tape of him singing "Can't Fight This Feeling" helped to land him the biggest role of his career, Finn on Glee. Following his success on Glee, Monteith's film work included the movie Monte Carlo and a starring role in Sisters & Brothers. In a 2011 interview with Parade magazine, he discussed his history of substance abuse as a teen, and in March 2013, he again sought treatment for addiction. In July 2013, he died of a toxic combination of heroin and alcohol in a Vancouver hotel room. Note: Do you have a family photo of Cory Allan Michael Monteith? Consider uploading your photo of Cory Allan Michael Monteith so that your pictures are included in Cory Allan Michael Monteith's genealogy, family trees & family history records. Sysoon enables anyone to create a free online tribute for a much loved relative or friend who has passed away. Address and location of Cory Allan Michael Monteith which have been published. Click on the address to view a map. Cory Allan Michael Monteith was born in Canada. 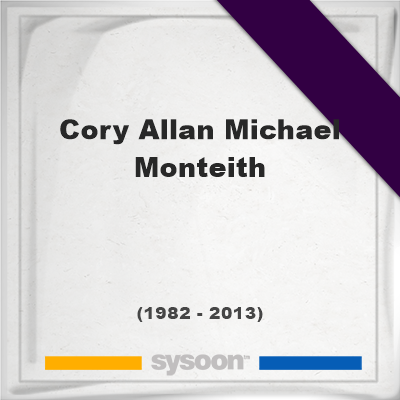 Cory Allan Michael Monteith died in Canada.